Many times an artist who hits the top ten is better known for acting. For example, within a three-year period during the 80s, actors Don Johnson, Bruce Willis, and Patrick Swayze hit the top ten for their first and only time. For an artist to be better known for his work on an animated children’s show, though, is a much rarer instance. Such is the case for Austin Roberts, one of those artists now thought to be a one-hit wonder…even though he wasn’t. Born George Austin Robertson in 1945, Austin Roberts first started out as lead singer of the group Arkade, which dented the bottom of Billboard’s Hot 100 twice in 1970-71. It was his other venture in 1970, though, which brought him into millions of homes every Saturday morning. It was in that year when Hanna-Barbera decided to get Danny Janssen’s La La Productions to record some new music for the second season of Scooby Doo, Where Are You! because they had had so much success teaming with La La Productions for Josie and the Pussycats earlier in the year. Around that time, Mr. Janssen was introduced to Mr. Roberts. When we did Scooby, my friend who became the president of the union Local 44—we grew up together—he said I got a kid I want you to meet. His name’s Austin Roberts. He said Austin has a good commercial voice. He ended up singing the theme. And so it was that, in an abbreviated eight-episode season of Scooby Doo, Where Are You, Austin Roberts is the voice you hear singing the theme. In addition, those eight episodes each feature one chase scene set to a bubblegum pop song, most written by Mssrs. Janssen and Roberts and all sung by Mr. Roberts. * As Scooby was enjoying very good ratings at the time, this brought Mr. Roberts a lot of exposure. Unfortunately, it wasn’t to continue, as apparently CBS decided it had enough episodes to simply rerun them for a couple of years and save some money while still bringing in viewers, and so Scooby Doo, Where Are You! was, seemingly quite abruptly, cancelled. Yeah, I know cancellation is hard, but the five of you will come back for bunches of other shows over the next half-century. 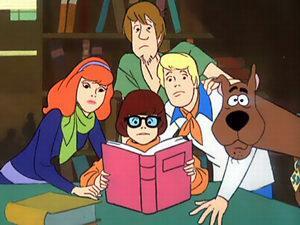 Picture © 1969 Hanna-Barbera Productions, Inc., shown under fair use guidelines. Following the cancellation of Scooby-Doo and the end of Arkade, Mr. Roberts continued to sing and write, sometimes co-writing with Mr. Janssen. It was one of those songs co-written by Mr. Janssen that brought Austin Roberts his first taste of top 40 success. Found on his eponymous debut album, “Something’s Wrong With Me” climbed to #12 in December of 1972. A follow-up single, “Keep On Singing”, did not perform as well, peaking at #50 in early 1973. That first album, along with its follow-up, The Last Thing On My Mind, both failed to chart, and so 1975 brought a label change for Austin Roberts, moving from Chelsea to Private Stock Records, and Rocky, which turned out to be his one and only album for that label, yielded him his biggest hit, though the album’s performance was about the same as that of the previous two. The first single from the album was its title track, a song actually not written by Mr. Roberts. It was an upbeat yet tragic story of a happy marriage ended all too soon by an untimely death. “Rocky” was released as a single just before Dickey Lee released a country version, which spent a week at #1 on Billboard’s Hot Country Singles chart. The version by Austin Roberts, while not hitting #1 on any charts, had a moderately successful chart run. It entered Billboard’s Hot 100 all the way down at #100 for the week ending July 19, 1975 (chart). It peaked at #9 in its 13th week, that being the week ending October 11, 1975 (chart). (It also rose to #22 (for the week ending October 25, 1975) on what was then called Billboard’s Easy Listening chart. **) After hitting its peak, however, “Rocky” went into freefall, only surviving another four weeks on the chart before falling off entirely. This was not quite enough for the single to make the year-end hot 100. While Austin Roberts continued to record and write songs after “Rocky”, he never again charted with anything he recorded, though he did write several songs which would become hits for others, including the song that would be Player’s second hit, “This Time I’m In It For Love” (which will probably make an appearance on this site at some point). 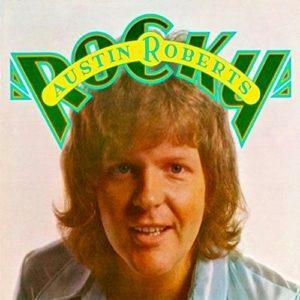 As for the most well known single from Austin Roberts, I’m sure the memory of the song is quite overshadowed now by the movie “Rocky”, released the year after the single. You can (very) occasionally still hear this little bittersweet tune from Austin Roberts on the radio, but it certainly isn’t common to hear it today. * Whether the songs have anything at all to do with the onscreen action at that moment in the episode is a discussion for another time. ** It’s now called the Adult Contemporary chart, in an attempt to not sound as if it lists music you’d hear in a 1970s elevator.